I am late to the Utah Photography workshop image posts, so here goes - first images from Capitol Reef National Park in Utah!! 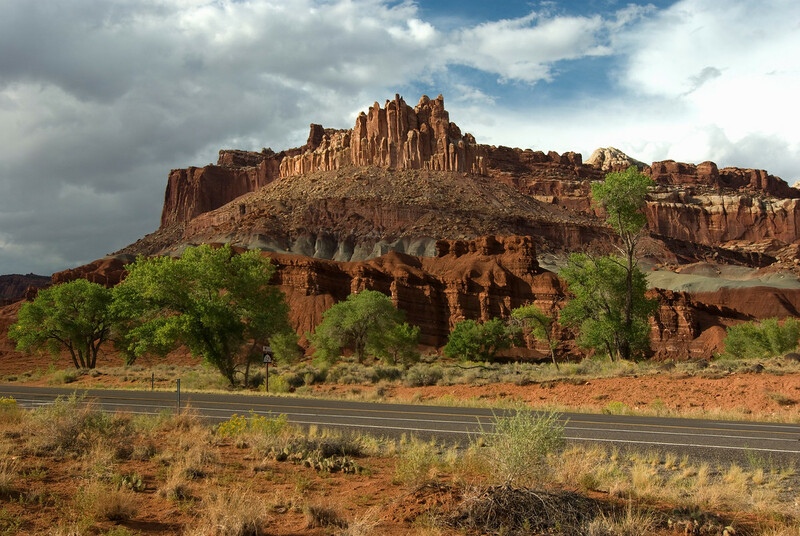 Both formations are right beside the visitors center at Capitol Reef. I think the gods of light were smiling on me with this first image. I cannot believe the air clarity and blues in the skies in this part of Utah. Evidently it's billed as the cleanest air in the US = visibility sometimes over 100 miles. These images have all been upped in resolution from 10.1MP to 25.3MP. This will translate into 6114 x 4113 pixels. IMHO, these images cannot do the real subjects any justice - this is but a shadow of the real thing. It's my hope the park folks will like them enough at 16 x 24 or 24x36 in print as a donation... Everyone in the workshop was kind enough to offer to pitch in for the printing/framing costs if the park accepts them!! 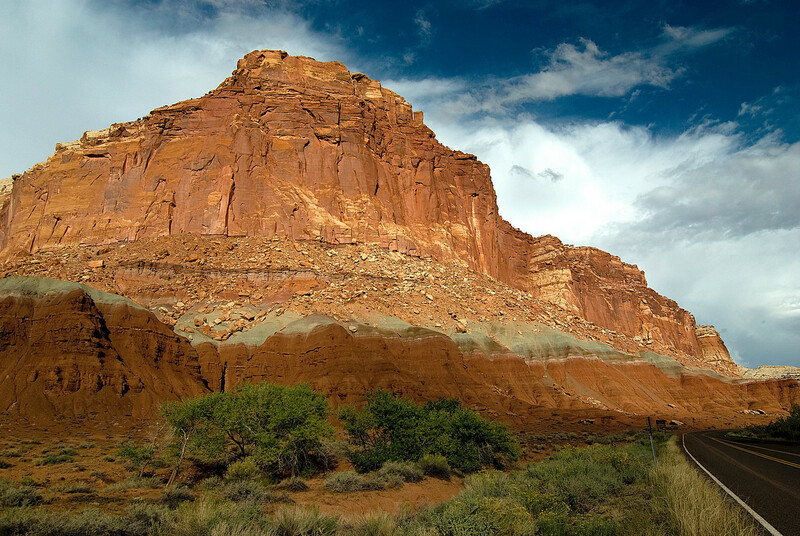 I am very pleased that at the request of the digital image librarian (a Park Ranger), several of my images taken at Capitol Reef will become part of the Capitol Reef National Park image library (with usage restrictions). I sincerely hope you enjoy these images. Last edited by Marc Langille; 09-22-2009 at 07:53 PM. Looks like a wonderful place! Can't wait to hear from Ole about the trip! Vivid colours and textures and great detail. Nice shots Marc, I love that scenary. It looks vaguely familiar. It's going to be really tough to pick one picture for the 16 X 20. Fantastic shots... I was actually in that area of Utah back in May. I haven't really processed any of my photos yet as work has swamped me for the past 5 months, but perhaps your images will inspire me to squeeze some time into getting those photos done. Capital Reef is fantastic, and I do know that your light definitely was a lot better than what I got, especially that shot of the Castle. I found a good shot of that rock elusive as the lighting just wasn't there to make it stand out. Perhaps in the next month or so, I'll post some of my own from this gorgeous place. Nicely done, Marc. Love these too. Glad to share them Jer! Marc, I am there ... well at least in the virtual world you have captured. Thanks for sharing the beauty. Much appreciated and it's hard to capture the scope of the vistas we saw. Such beautiful scenery! Sounds like you guys had a great time. Photos from everyone the last few days have been incredible. I wish I could have participated but I do hope to do the trip to Utha parks next years vacation. Thanks for posting. Incredible photos Marc! Excellent shots Marc. Clean and vibrant. All the elements are well composed. Love those variegated rocks. Heinrich is right, the gods of light, seen in the second image, just to the left of the big green tree on the right, apparently are indeed smiling at you. Thank you JMR! It's so hard to describe how HUGE some of these geological formations really are - they are wonderful in terms of sheer size and scope. Of course, having such incredible cloud formations during that week was just an huge boost to being able to include more sky when framing a shot. and we're not done with it either. My honor Bud! It's a beautiful area and I'm getting the impression that we may return, based on commentary from several folks. Thank you John! It's better to have some tough choices instead of only having one to choose from!